Greetings from the Community Forum on Accessible Information and Communication Technology! We’re here at the Access Board on a Friday, and are graciously brought together by the FCC and the Washington Metro Disabled Students Collective (WMDSC). One of the overarching themes that we’ve realized today is not only the importance of technology at a young age in education, but the necessity of accessible technology. Jamal Mazrui, the Deputy Director, Accessibility and Innovation Initiative of the FCC started the event with this: “We often don’t get young people into the Commission….we want to respond to the concerns of young adults with disabilities. We really want to empower people with disabilities with the disability rights that Congress has given them”. Part of the issue we’ve realized is lack of awareness, and that many of these entities are covered by laws. Mazrui talked about the rights of individuals with disabilities by bringing up provisions of the ADA and Section 508, specifically the update. Next, David Baquis of the Access Board discussed Section 508. As we’ve all been waiting for the update/refresh for many years, we’re pleased that the comment period is here. A lot of organizations have adopted the Section 508 standards for their websites, software, telecom products, computers, videos, office equipment, and more. During the refresh period, students are encouraged to comment on the proposed rulemaking. Students can comment on the ICT NPRM, and Baquis let us know the various methodologies to go through and submit a comment. Feel free to check on the progress at regulations.gov, and great news, the rule is published in the Federal Register. Next, Rosaline Crawford of the FCC was thrilled with the turnout. The audience was full of students, and was ‘pleased to see the young people who will be taking over’. She went through some history of accessibility in ICT. The marketplace has not resulted in accessible technologies. Because they are not responsive to the needs of people with disabilities, Congress has had to step in and enact laws through the Departments of Justice and Education, as well as the FCC. If we have access to ICT, like education, jobs, commerce, entertainment, and civic engagement, we can ensure independence and privacy. New technologies can make things more and less accessible, so we need to think of accessibility from the start of innovation. It must be baked in when it hits the market: that’s the goal. It was an absolute thrill, she recounted, to be there for the singing of the CVAA. As we’ve been seeing, assistive technology is now being built into more devices. This is such a change from what was the norm just a few years ago. Items like screen readers and magnifiers are standard, and more features are becoming commonplace. The CVAA also says that Internet browsers must be accessible, which improves the overall experience of a mobile phone by a user with a disability. Being Autism Awareness Month, we heard from some amazing panel speakers. There was some amazing insight by Jaggar DeMarco, from the National Council on Independent Living at George Washington University. Deepa Goraya represented the Washington Lawyer’s Committee for Civil Rights and Urban Affairs, and talked to us about transportation options like Uber and Lyft. 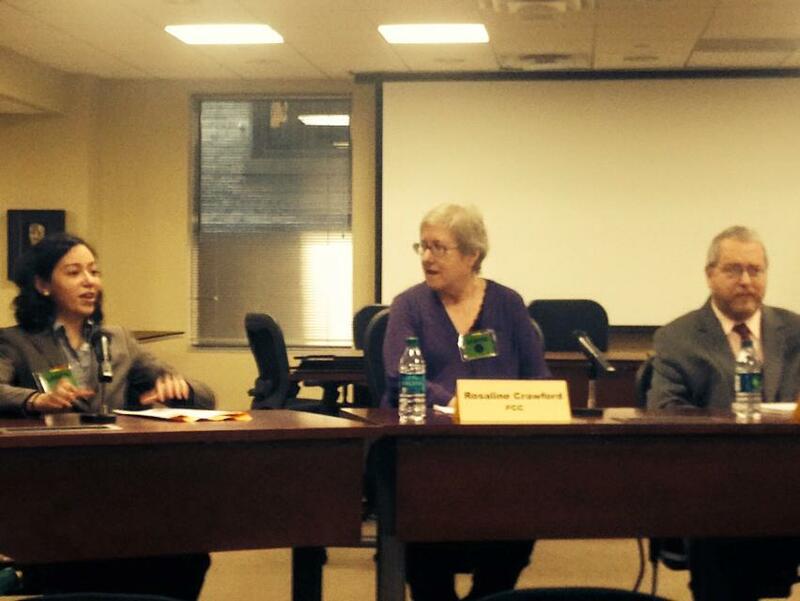 We also heard from Jacqueline Wunderlic, of Gallaudet University, and Scott Robertson of the Autistic Self Advocacy. The room was chockfull of students, including from educational institutions across the region. It was an inspiring event, and Accessibility Partners Learned a lot! Always a treat to be back in the Access Board—our favorite hub for the latest and greatest in accessibility.